Want to get the most out of your daily vegetables? This is Sandra Tsing Loh with the Loh Down on Science… with good news! Veggies and greens may be good for you, but they can sure taste boring! 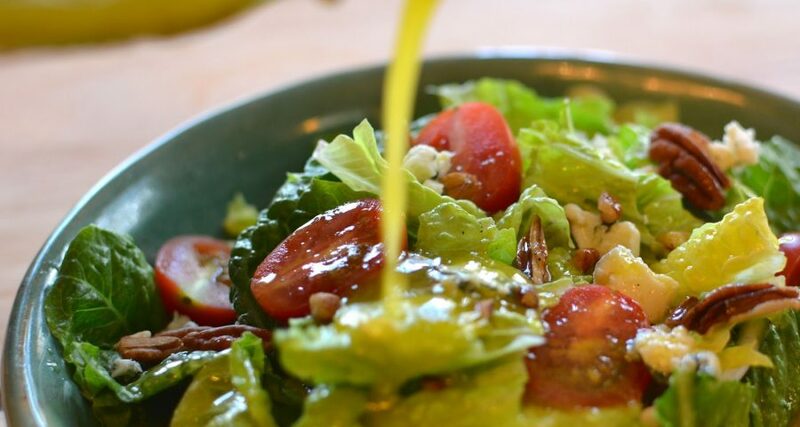 Some oily salad dressing would spice things up, but that can’t be good for you. Or can it? Wendy White of Iowa State University may have the answer. In her study, researchers had about ten college-aged women eat salads. Each salad was dressed with a different amount of soybean oil. The type used in most salad dressings. Afterward, the scientists took blood samples to measure the nutrients their bodies absorbed. The researchers found that the fat from soybean oil helped participants absorb MORE nutrients in salads. Eight different micronutrients to be exact! Making the most out of those leafy greens to keep you healthy. Better yet, scientists found that the amount of absorbed nutrients and oil added are proportionally related. That means, more oil… more nutrients to your body. But don’t go crazy on the dressings. Stick to the daily recommended two tablespoons of fat. So, keep calm and carry on – with your salad dressing!